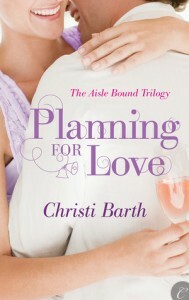 Planning for Love is the first book in Christi Barth’s Aisle Bound trilogy. This series focuses on two ladies who co-own and run a wedding planning business in Chicago and their friend who manages a romance shop. This time around we follow the wedding planner Ivy as she meets Bennett. Ben is both the love of her life and the Bain of her existence. Ivy and Ben are the perfect match…except when it comes to one thing: their ideas on love. Ivy grew up surrounded by happily married people. She can’t wait to meet her one and only so she can finally know the joy her parents have felt all the years that they’ve been married. Ben has been raised in the completely opposite environment and thinks that love doesn’t really exist and is convinced he will never ever marry. He likes fun. Ivy likes commitment. Ben scoffs at the very thing Ivy looks up to, so you can imagine that this clash of opinion adds a fair bit of tension in their ‘relationship’. I did like Ivy and Bennett. I found them to be endearing characters…but when they started arguing about their views on love they drove me bonkers. Sometimes Ivy seemed a bit too eager for love and how she planned on manipulating Ben didn’t sit well with me. And Ben, when he went off on how love didn’t exist and how falling in love is stupid and so on, it just made me wonder if he ever really learned to truly think for himself. Yes, we are all shaped by our past and by what we know growing up but as adults, we usually analyze what it was we saw as children and decide whether or not it is relevant to our real-lives today. But these two seemed to have missed that step and take what they saw growing up as absolute truth. Of course, their characters come to terms with each other but I didn’t feel either really learned much or grew much. Bennett did mature a bit through the story (the things he ends up doing for Ivy without even realizing they were the sorts of things boyfriends did for and with girlfriends were adorable) but I would have liked to have seen a bit more growth on Ivy’s part. The overall story was cute and I loved the premise. (I love weddings and once or twice have considered becoming a wedding planner so this series is right up my alley) The pace was good and the meet-cute was fun. I like Christi’s writing voice and I find it is very well suited to the contemporary romance genre. She writes delightful stories that feature cute moments that make you smile. I am sure that this will come as a total surprise to you, especially after hearing how anti-romance and love and such that Ben is, but he is has a bit of a douche moment and basically becomes a huge arsed jerk in a matter of a scene. But boy does he make up for it. (I don’t think this is necessarily a spoiler seeing that this is a contemporary romance book but in case you are extra sensitive to them, beware) This book contains one of the best make-up/grovelling/marriage proposal scenes that I have ever read. Is it cheesy and a little bit schmaltzy? Absolutely. But it’s so sweet and lovely too. Really, it’s amazing and the perfect way to end this couple’s journey to finding each other. The circle of friends that is introduced in Planning for Love was amazing. I can’t wait to read more about them in their own books. The next book will be titled A Fine Romance and is due to release in March 2013. It’s going to be Mira and Sam’s book. Book three, Friends to Lovers, will be Daphne and Gib’s book and is hitting eBook shelves later in 2013. The books will also eventually be released in print. Overall I did enjoy Planning for Love even though the main characters weren’t the best characters in the book. I am definitely planning on reading the other two books in the series when they release. There is such a warm camaraderie amongst the friends and I am looking forward to visiting them again. p.s. If you are like me and enjoy looking at visual inspirations used by Christi while writing this series, you can check out her Pinterest boards here. Share the post "Review: Planning for Love by Christi Barth (Aisle Bound #1)"
I completely agree with your review Julie! That final groveling/proposal scene was so touching and sweet, I loved Ben then 🙂 And the secondary characters were truly wonderful! Can’t wait to read their stories.